(Washington, D.C.: National Foreign Language Center, 1992). 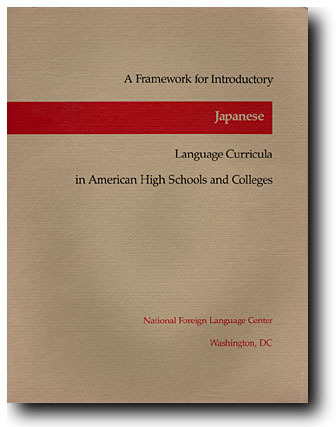 This volume was produced under a grant from the National Endowment for the Humanities that also supported the development of the Japanese language achievement test by the College Board, which is now part of SAT II. 2002. The First Framework: Getting Down to Basics, Advances in Japanese Language Pedagogy, ed. Hiroshi Nara, pp. 336-428. Columbus, O.: Foreign Language Publications.